My son absolutely loves Transformers and the television series, Rescue Bots is one of his favorites to watch. We had an opportunity to check out the latest DVD, Return of the Heroes and he was super excited because his favorite Transformer, Bumblebee was back in action and better than ever help saving the day. This DVD is filled with five different episodes that my son couldn't take his eyes off of. It definitely kept him entertained and playing with his Transformer toys all over again. This is definitely a great show for your little guys to watch and even little girls. Return of the Heroes is now available on DVD and retailing at $14.93. 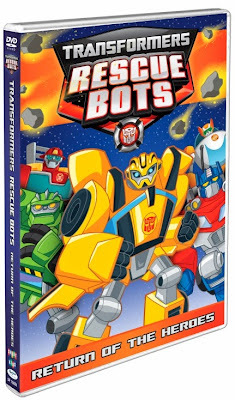 For more information about this DVD and other Rescue Bots DVD's be sure to head over to www.shoutfactory.com.